Welcome to the Newburyport PMC Kids Ride! The Pan-Mass Challenge has an unwavering commitment to finding a cure for cancer. Since its start in 1980, the PMC has raised $654 million for cancer research and treatment at Dana-Farber Cancer Institute (DFCI). Although each individual rider has a personal reason for taking part in the event, they are strongly united in their cause…cure cancer. The monies raised from the PMC account for over half of the total funding for the Jimmy Fund each year. 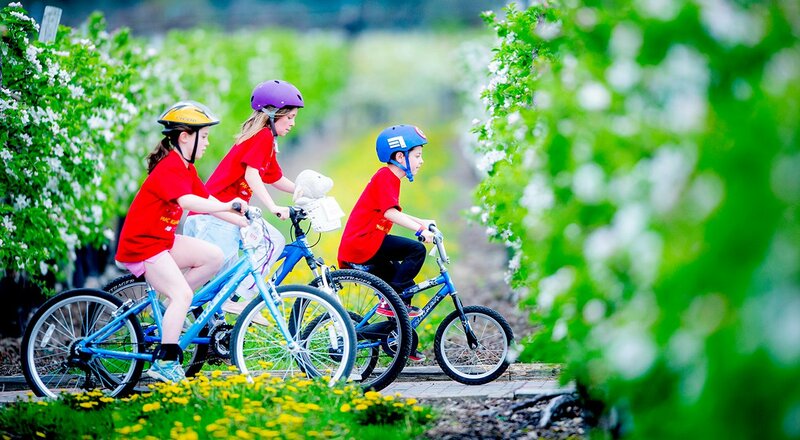 On June 9, 2019, kids in the Greater Newburyport area will continue this established tradition of bike riding and fundraising for DFCI for its eighth year. Last year, the PMC Kids Rides collectively raised approximately $950,000! Make the commitment to join us because you want to help cure cancer! This ride is dedicated to all of our loved ones whose lives were cut short by cancer and to those who continue to inspire us as they live with cancer. 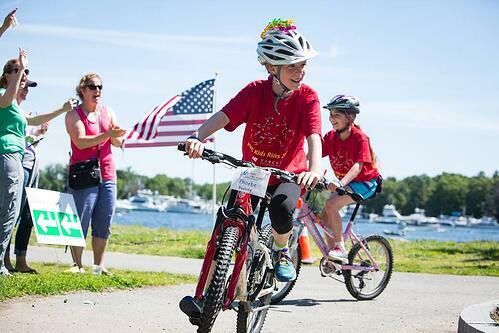 The Newburyport PMC Kids Ride will bring us "closer by the mile” to a cure! Suggested parking: There is parking at Cashman Park Soccer Field and Cashman Park Boat Ramp. Please use extreme caution making your way to the playground area of Cashman Park from the parking areas, as there are boat ramps in use. 8:30 am – Volunteers arrive and meet at Cashman Park between the baseball field and playground. Meet with crew leaders and review job expectations and responsibilities. 9 - 9:30 am – Check In/Registration: Pick up rider t-shirts, water bottles and bike numbers (must be put on your child's bike). While we prefer donations to be done online, if you have fundraising checks you can drop it them off at this point. 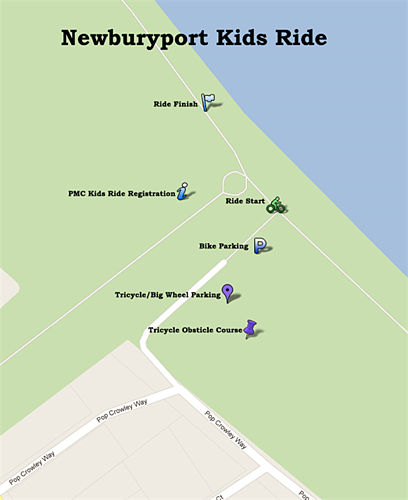 9:30 - 10 am – Opening Ceremonies: At Cashman Park between the playground and baseball field. We will do a warm up for riders and take a group photo. 11 am - 12 pm – Fun at Cashman Park! There will be entertainment, refreshments, face painting, temporary tattoos, balloon artists and more! Clipper City Rail Train (Ages 4 - 13): Riders will ride the 1.1-mile length of the Clipper City Rail Train to just before Parker St. where they will reverse direction and return to Cashman Park. The finish will be just to the right of the rotary in front of the playground. When riders are done, they should get off their bikes at the finish and walk them over to the designated bike parking area. Kids ages 10 - 13 who are still rearing to go can enter the rotary, loop around to the left and set out to do the route a second time. There will be a volunteer ride marshal with each group of riders - 10 to a group. Remember - THIS IS A RIDE NOT A RACE! Only volunteers and riders should be on the rail trail. Parents can cheer on the riders from the grassy areas at Cashman Park and meet their child at the finish. Trike Obstacle Course at Cashman Park: Big wheel and tricycle riders (ages 3 and up) can ride around the obstacle course set up on the tennis courts at Cashman Park. Parents of these children should line the perimeter of the tennis court. The Newburyport PMC Kids Rides relies on local sponsors to help keep costs low and so that the PMC can continue to donate 100 percent of every rider-raised dollar directly to Dana-Farber Cancer Institute. If you or your company are interested in becoming a sponsor or to donate items (pizza, ice cream, snacks, sporting tickets, gift cards, baskets, etc. ), please click on the button below.